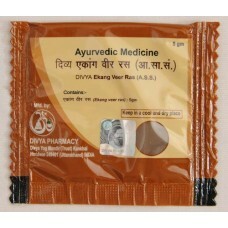 Ekangveer Ras treats chronic back and leg pain, debilitating effect of stroke and gastric problems. Ekangveer Ras is made through a painstaking process to combine natural and herbal extracts. These components are a natural source of calcium, vitamin D and other nutrients which nourishes our bone structure and relieves us of pains. Ekangveer Ras also has antacid effect which facilitates digestion. Do not be held back by crippling aches and pains. Regain agility and enjoy life with Ekangveer Ras.